I ran across this while plundering through some old trunks tonight. Robert N. Green was the son of John Green (1780-1863) and Hannah Bell Thompson daughter of the Honorable John Thompson, Esq and Susan Andrews of Chatham County, N.C.. He was born on Nov. 19 1810 on Rocky River, Chatham County, and died in Chatham County on Dec 24, 1896 in his 87th year. He married Prudence Norfleet Ward in Feb 1843. In 1859 Robert bought the old Joseph Ramsey Mill with 502 acres of land on Rocky River for three thousand nine hundred and one dollars. Later he gave three acres to Pleasant Hill Methodist Church where the new church now stands. He helped organize several Masonic Lodges in the county, and, in 1858 and 1861, he was chosen to occupy one of two seats from Chatham County in the North Carolina General Assembly. Before the Civil War he was an outstanding leader in his community. He was too old for military service but his son, John Green, was a cavalry soldier in the Confederate Army. ( I can’t help it, folks. My ancestors are all Colonial Southerners) His granddaughter, Mary Alice Green, remembers him as retaining a remarkable memory throughout his old age. Man! I hope I get some of his genes. I can’t find anything anymore. His wife, Prudence, was remembered as a devout Christian who exerted a strong influence upon her family. I find that interesting because one of her grand children became a minister and one became a Methodist Missionary to China. My grandmother used to be unflinching about the age of the earth being 6000 years. I guess Prudence did wield her influence on into the generations to come. What happened to me? ~ by Sandra Lynn Gray on October 19, 2007.
amazing photo. 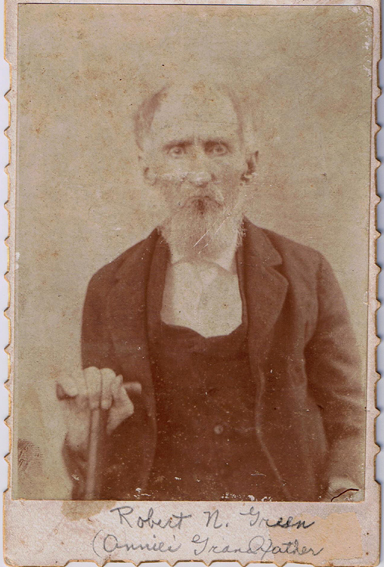 In the photo your great grandfather looks about as stubborn as my grandpa. I love this kind of history! I also love seeing this kind of history. It reminds me of some of the history in the series of books called “Foxfire”. Yes, I am loaded up with this family history. Before he died, my father was able to complete two genealogies. The first, called Lest We Forget, sold out but I have the several boxes of the second book. There was a house fire which left him homeless and he moved in with me and my family. The family photos were destroyed so it is just great that he published them in those books. I found the real photo of my great great grandfather last night and that is why I scanned it and posted it. I bet he would have made a great Foxfire character. He does look like he has plenty of self confidence….another way of saying headstrong. foxfire.. that made me smile – your the only people I know that is aware of the series. What a great group of books… I take much of my quilting out of those books. The trick? I have to do all the math myself but love the challenge. I fell into them accidentally and fell madly in love. Sincere I really laughed.. I love history, but genealogical research is something new to me. I only recently started tracing family roots after my father died in September. How wonderful that so much of your family history was put together by your father. How fortunate that the family photos were saved in the books before the fire. It is fortunate to have this information distributed broadly. It is less likely to be lost. I am really sorry to hear about the loss of your father so recently. I know something about what that is like. Thomas Riddle Green, grandson of Robert Nathaniel Green. It is a small world after all. HI…..COUSIN. My family hails from R.N.G. I enjoy your photo. My mom, Myrtis Green Moore along with Grace Tysor, Clara Atwater, Thomas William Green has collected data as long as I can remember. We just had our family reunion in Chatham County NC. Drop me a line sometime. We need to connect more limbs on the family tree.